Hugo is a static site generator written in Go. It is optimized for speed, easy use and configurability. Hugo takes a directory with content and templates and renders them into a full html website. Hugo makes use of markdown files with front matter for meta data. 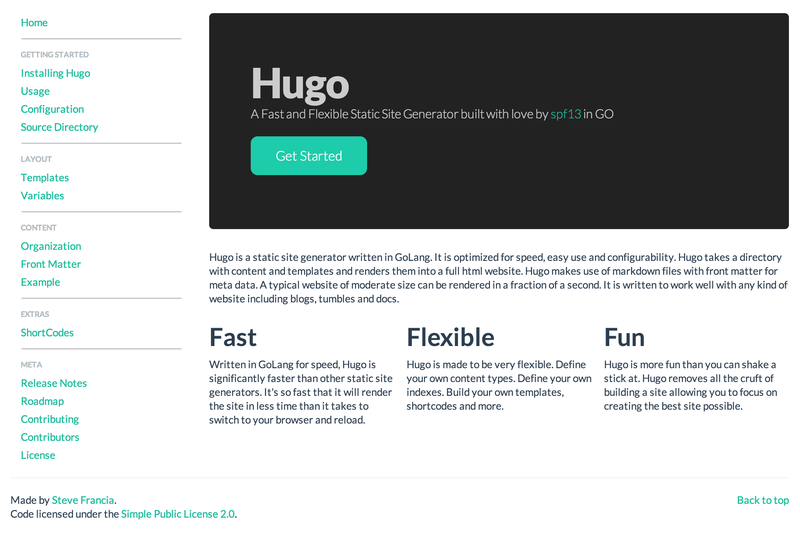 Written in GoLang for speed, Hugo is significantly faster than most other static site generators. A typical website of moderate size can be rendered in a fraction of a second. A good rule of thumb is that Hugo takes around 1 millisecond for each piece of content. It’s so fast that it will render the site in less time than it takes to switch to your browser and reload. Hugo is made to be very flexible. Define your own content types. Define your own indexes. Build your own templates, shortcodes and more. It is written to work well with any kind of website including blogs, tumbles and docs. Hugo has his own site. Hugo is written in GoLang with support for Windows, Linux, FreeBSD and OSX. The latest release can be found at hugo releases. We currently build for Windows, Linux, FreeBSD and OS X for x64 and 386 architectures. Ideally you should install it somewhere in your path for easy use. /usr/local/bin is the most probable location. The Hugo executible has no external dependencies. If you only want to build from source, it’s even easier. Hugo is released under the Simple Public License. See LICENSE.md.